This year for Earth Day we are giving the teachers a cup of dirt. 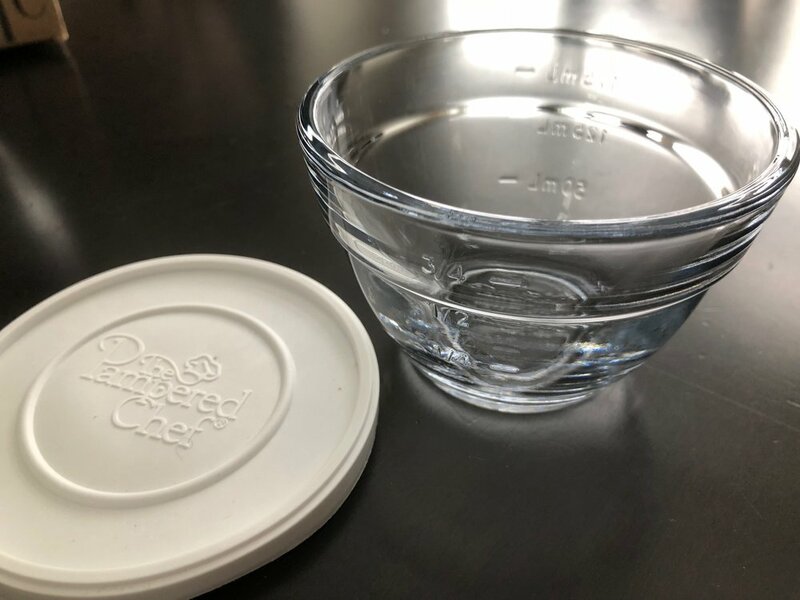 Months ago I bought "1-Cup Prep Bowl" containers from Pampered Chef because they were on sale and because I like to support my cousin's business. I knew that, in some capacity, these would be given out as thoughtful pinches because these containers are little gems. People can use them instead of Ziplock bags for the little bites that they can't finish now but could later. Or use them when they only need to make a serving or two of fresh salad dressing. Or these bad boys come in handy when prepping the ingredients needed to make the 5-course dinner or bake the Cupcake Wars dessert. Families with babies and toddlers can use these containers to keep food rationed out for easy, go-to snacks and meals. Heck, adults should use them for portion control! The list of uses for these prep bowls can go on forever. Storage is a part of life and I think these containers are pretty darn Earth-friendly. Six prep bowls come in a box. I bought four boxes. The clear feature of this container is important because chances are, if you can see what you're storing, you will most likely use it. This means less waste. Not to mention food tastes better when it doesn't taste like plastic, tin or foil. Using glass is also important because the potential to re-use it is endless. The lid makes it easy to keep things fresh - keeping what's inside safe from what's on the outside. The bonus feature: measurement lines. I'm sounding like a spokesperson for Pampered Chef but I'm not. Nor am I sponsored by them (yet?). My point is this - if there is A LOT of waste in our country, then we can do our part by making smarter choices when it comes to storage containers. Let's leave behind less carbon footprints, shall we? Glass containers (they don't have to be Pampered Chef) are a better option. This year, with the Earth Day theme in mind, our thoughtful pinches will be these containers filled with dirt. Not real dirt but edible dirt. The kids had fun making a sweet treat and I feel good about giving the teachers something they can use over and over again. 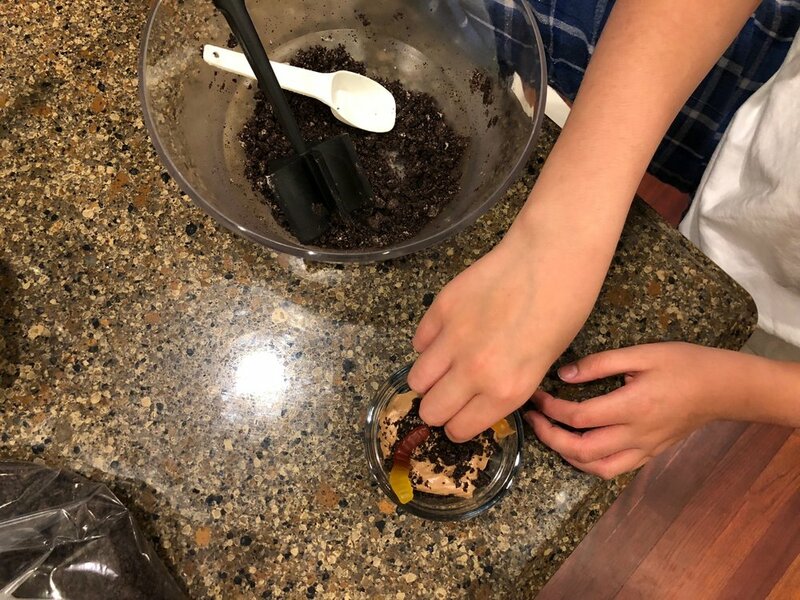 My good friend, Pinterest, had a bunch of "Dirt" recipes but I chose one that was ultra-simple because I wanted my kids not only to enjoy giving this thoughtful pinch but have an active part in making them. 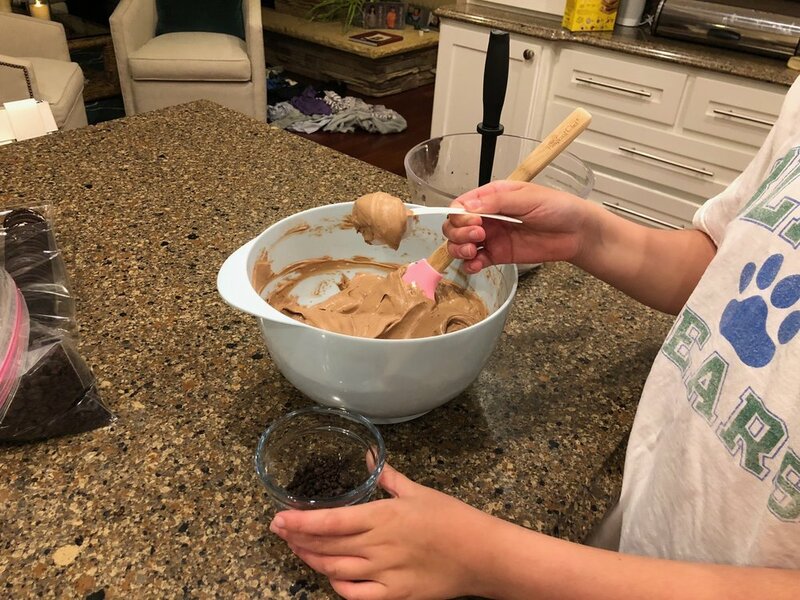 I'm sharing this older post for a dirt recipe because I liked the author's message about being kid-friendly. Gluten-free shouldn't stop you from making/enjoying this cup of dirt. Trader Joe's makes a great GF Oreo alternative. The worms were bought in bulk at Whole Foods. The pro Oreo crusher makes the dirt. She made the pudding then soon took over making the dirt because he was too busy eating the Oreos that fell out of the bowl. Then she folded the homemade whipped cream into the pudding to make a lighter colored mud. "If you re-use this container, you will be doing your part in keeping our landfills less full. Even small steps make big impacts. 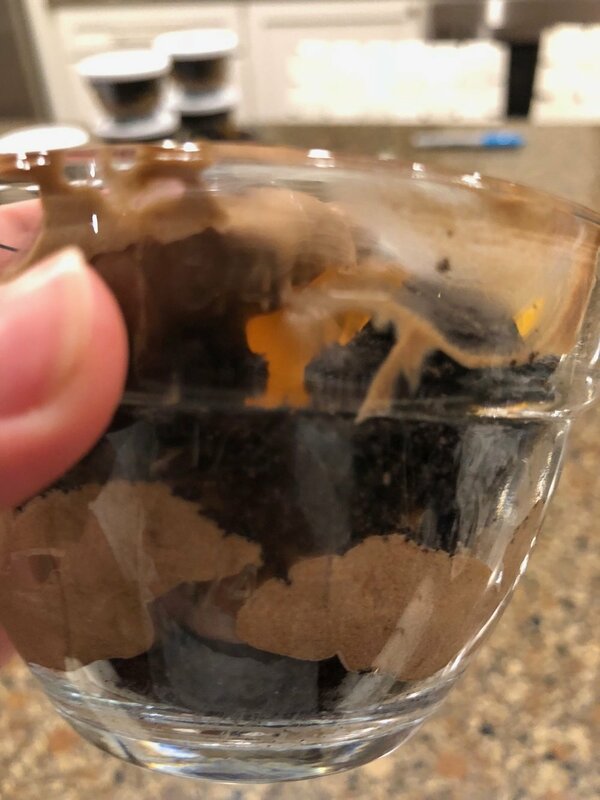 Bella and Beau enjoyed making you a cup of Earth (Oreos and pudding). You will see a few worms (organic gummy candy) who were delighted to come out from under the snow. Happy Earth Day! Be sure to celebrate on April 22nd. Love, The Patons"
On Earth Day, we speak about awareness. We make resolutions for kindness to land and seas. Earth Day is THE best time to keep our minds open so that we can receive information about better ways to take care of the Earth. Give an Earth Day thoughtful pinch as a reward to someone who is already doing their part to leave behind less carbon footprints. Or better yet, pinch someone who needs a reminder to be gentle and kind to our Earth. Sunday, April 22, 2018 is Earth Day. It's a perfect day to be thoughtful. Update 4/20/18 to show the process and the added features to our "Dirt" gift. Video of final product follows the gallery below.